This north end neighbourhood has a long history of being home to the city’s more prominent residents looking to get out of the urban environment and escape the city’s high property taxes, at least until it was annexed by the city in 1961. The area benefits from its close proximity to the downtown, to the University of Western Ontario and to the major shopping area that surrounds Masonville Mall. A little older and more settled some of the city’s new prestige neighbourhoods, this area is still largely a suburban enclave with large custom homes on large lots and boasts some of the highest property values in the city. The area is wrapped on two sides by Medway Creek and the green space corridor that surrounds the creek on both sides and is characterized by rolling hills and curved streets. This area is sometimes known as Medway Heights or Sherwood Forest. Built in 1925 by John Smallman, The Windermere Manor is a faithful architectural reflection of Tudor, England and a fitting tribute to John’s father Thomas, a founding member of The Imperial Oil Company. The Smallman family had a passion for breeding and racing horses. Down the path between the hotel and Manor House, there are remnants of an old stone bridge that was once part of a horse run that wound through the property. The original farm was a horse farm and cash crops were also grown. Although slightly altered, the Manor’s interior retains the feeling of a by-gone era of warmth and luxury. The baronial splendor of the Grand Hall, with it’s lofty ceilings, hand-hewn beams, oak balcony and welcoming wood-burning stone fireplace all echo a by-gone era of pageantry and privilege. The hotel is built atop of what was once the large in-ground swimming pool. 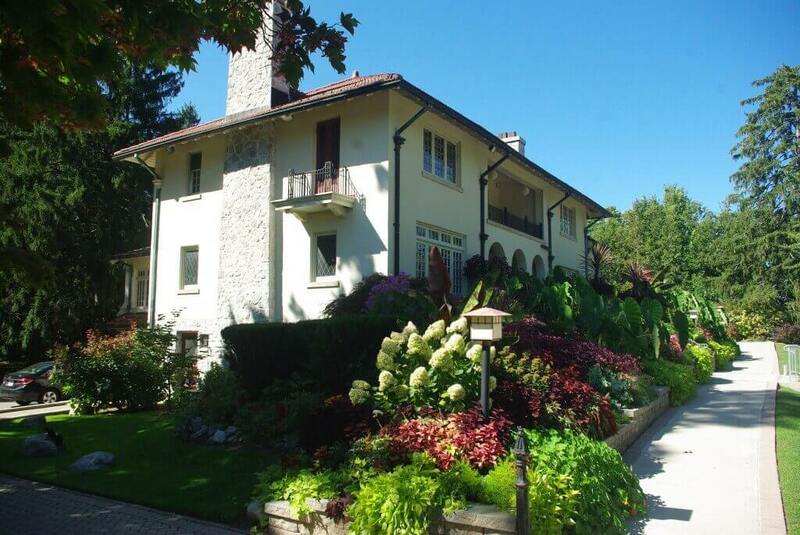 After extensive renovations on the existing Manor House, The Windermere Manor opened it’s doors in 1991 as a component of the University of Western Ontario’s Research Development Park offering meeting/conference facilities, food and beverage and hotel accommodations. Windermere Manor is a hotel, restaurant, banquet hall, and conference facility – all with resort-like atmosphere. More recently, additions and renovations have allowed for meeting spaces and a guest room wing that were designed to gracefully blend with the original structure and convey a sense of period continuity. These annexes provide today’s guest with all of the comforts and conveniences of a modern hotel and meeting facility. The Spanish design estate house is situated on 68 acres of parkland at the far west end of Windermere Road. It’s a popular setting for weddings, a quiet retreat for meetings and workshops, and a cozy home-like atmosphere for parties. The spacious estate house, as it proudly stands today, was reputedly built by architect John Moore in the early 1900’s using sketches drawn by Mrs. Williams as the basis of his design. stucco walls, wrought iron balconies, a red clay tile roof and beamed ceilings are only a few of the unique qualities that make the Elsie Perrin Williams Estate as timeless in design as it was years ago. On her death in 1934, Elsie Perrin Williams bequeathed the estate to the city with the provision that her housekeeper have lifetime use of the property. Following the house keeper’s death, City Council approved Heritage London foundation’s request to open the estate and grounds for public use. Numerous other events held at the Estate are now considered annual events. The Spring Open House for the Estate and Grosvenor Lodge is always well organized by the the staff of the Elsie Perrin Williams Estate and the Heritage London Foundation. Each summer Stan C. Reade Photo host their annual Photo Day. Medway Creek is one of 28 sub-watersheds in the Upper Thames River watershed. The Medway Creek watershed is 205 km2and encompasses parts of the City of London, the Municipalities of Middlesex Centre, Thames Centre and the Township of Lucan Biddulph. The headwaters of Medway begin north of Highway #7 (Elginfield Road) around Granton, and the creek outlets to the North Branch of the Thames River, by the University of Western Ontario in London. Other tributaries that flow into Medway Creek include Cook Drain, Elginfield Drain, Edgewood Drain, White-Fitzgerald Drain, Risdon Drain, Mills-Guest Drain, Colbert Drain and Snake Creek. The area is also home to Masonville Public School.